We’d love your help. Let us know what’s wrong with this preview of Kingdom of the Damned by Tricia Copeland. To ask other readers questions about Kingdom of the Damned, please sign up. by Tricia Copeland was a fast moving, dark , unique engaging read that had me hooked from start to finish. My first read by this author and this series I didn't know what I was getting myself into. I have to say I quite enjoyed this dark, heart breaking, feels crushing read through time, centuries and not giving in. This is was something, and now I have to go back and read the other books cause this book seemed like a filler. Not that it was full of filler, but it had filler info in regards to other books. I now believe I have a good background to jump into to what's looking like a epic series. I don't have anything bad to say, I was captured from the first pages, that first heart breaking scene where I grew oddly attached to our young MC. Following her journey, got me in the feels. This mature girl was well grounded and her character development was massive. This book is a gem. If your haven't guessed I give this book my super high recommendation and my stamp of approval. Kingdom of the Damned: Provocation is the prelude to the Kingdom Journals by Tricia Copeland. It is a paranormal fantasy full of vampires, witches, history, drama, suspense, adventure and discovery. This book is so wonderfully descriptive and vividly detailed, bringing every scene to life before my eyes. The imagery is superb. Ms. Copeland is a fantastic author who delivers a complex and captivating story- I loved how she combined some history with fantasy and made it entirely believable. This is the prelude to the other books in the series- “ Kingdom of Embers” (Book One: Alena’s story), “Kingdom of Darkness” (Book Two: Camille’s story), “Kingdom of Honor” (Book Three: Jude’s story) and “Kingdom of War” (Book Four: Hunter’s Story- due for release in 2019) so you don’t need to have read the other books in the series first, but I can guarantee you will probably want to by the time you’ve finished this. Anne Scott was born a vampire and would have good reason to be full of hate and anger- her family were all killed by witches, forcing her to flee to a foreign country when she was only two. Living among humans wouldn’t have been easy, but she not only survived, but thrived. But then tragedy strikes again, devastating Anne once more. Heartbroken, she searches for meaning, for belonging and ends up on an epic journey of discovery, that fuels her passion for peace. Anne really is a fantastic character, but then I really wouldn’t have expected anything less from Ms. Copeland. All the characters were fully developed and interesting. The character growth over the course of the story was wonderful to see. I love the solid foundation that this book brings to the series, as a whole, and helps me to better appreciate it. I can’t wait to get my hands on the next book! For those of you who are hoping that the storyline of this series would progress, I'm sorry to say that you're going to have wait for the next book in the series. Okay, I'm not really sorry because I love character development and this book has it in spades. The setting and characters are downright compelling! It's an incredibly diverse group of characters and the setting changes frequently as Anne travels through different continent I received a free copy of this book and opted to post a review. The story Kingdom of the Damned: Provocation (KIngdom Journals) by Tricia Copeland is a paranormal/fantasy book the I loved reading. It is a wonderful story that includes vampires and witches. It draws you in from the very beginning and I didn’t want to put it down until I had read the final page. I loved reading about Anne. She is a vampire who has survived in the world of humans. She is strong and independent. Anne has a drive and passion that draws others to her and they follow her. She is one that seeks to unite vampires and to bring about peace. As I read her story I couldn’t help but be impressed by Anne and found her to be a character that I could root for and want to succeed in all that she does. I could also empathize with Anne as she has had to deal with loss and situations that cause her to feel guilt and grief. I loved that Anne is one that wishes to preserve life. Will Anne be successful in bringing about peace? Will Anne ever find romance and happiness? Read this story to find out. There are many other characters that are introduced in this book. Anne has many who support her and those she considers her friends and family. The bonds between them are strong and also is the need to protect each other. There are also those who have their own agenda. They will do all that they can for their plans to succeed whatever the cost. This is a fantasy story that is wonderfully written and one I would recommend reading. It is a prelude to the Kingdom Journals Series and can be read as a stand-alone. I find myself looking forward to reading the other stories in this series. I give Kingdom of the Damned: Provocation (Kingdom Journals) by Tricia Copeland, 5 stars. Anne's whole vampire family was murdered by witches when she was just a child. Luckily, she saved by a wonderful woman and they flee to start anew. There they live a quiet life among the humans. As a young adult, her life is again turned upside down. She knows that in order for the supernatural beings to survive, they need to stop fighting one another. So she starts out on a journey to reach every clan and I give Kingdom of the Damned: Provocation (Kingdom Journals) by Tricia Copeland, 5 stars. Anne's whole vampire family was murdered by witches when she was just a child. Luckily, she saved by a wonderful woman and they flee to start anew. There they live a quiet life among the humans. As a young adult, her life is again turned upside down. She knows that in order for the supernatural beings to survive, they need to stop fighting one another. So she starts out on a journey to reach every clan and ask for peace. This takes her on a journey spanning hundreds of years and unbelievable distances. Along the way, she makes many allies, along with life-long friends. She makes enemies too. But the things she learns is worth it. Can she bring peace? This book is incredible. It cover an incredible amount of time and hits on many important events that happened. Twisting them a bit to include both witches and vampires is ingenious. Not to mention how well the author has done it. She weaves a story that draws you in and makes you believe. I still can't believe how well it was done. And Anne -- wow. She is such a perfect lead character. She has flaws, like any good character, but she learns from them. She lives with her heart, and the growth she goes through really makes you feel for her. She has had such tragedies in her life, but she has never given up. This book spans four centuries. It takes us on a trip from the 1500’s to present day. It was like taking a trip through history through the eyes of a vampire. This is Anne’s story. In 1557, the Edict of Compiegne allowed the witches, dressed in the cloth of the church, to hunt and kill vampires. Anne survived persecution with the help of a friend. She grows up in London and at the age of seventeen, devastation hits her again. Instead of becoming angry and vengeful, she seeks understanding and peace. Travelling the world she makes many friends and powerful enemies. She tries to unite vampires and stop the hatred between them and witches. Let me just start with the gorgeous cover of this book! I adore it, and it lured me in before I even read the synopsis. I have read Tricia Copeland’s work before but I think this has by far become my favorite novel of hers yet. I think the paranormal genera is her strong suit, and I am dying to get my hands on the remainder of this series as it is released. This is the introduction or prelude so to speak of the Kingdom Journals and really sets everything up for the reader. I love when an author Let me just start with the gorgeous cover of this book! I adore it, and it lured me in before I even read the synopsis. I have read Tricia Copeland’s work before but I think this has by far become my favorite novel of hers yet. I think the paranormal genera is her strong suit, and I am dying to get my hands on the remainder of this series as it is released. This is the introduction or prelude so to speak of the Kingdom Journals and really sets everything up for the reader. I love when an author does this because it entices the reader to come back for more. It has us hooked on the story and invested in the characters. I know I need to find out what will come for Anne in the future. Who is Anne you ask, well I will give you a brief hint, but for the majority you will have to one-click this beauty to find out for yourself, and you won’t be disappointed. Anne is a vampire. Her and her family are living among pagans and trying their best to blend in and hide to stay alive. Anne has one goal, to bring peace to the world. This is no small feat, in fact it seems nearly impossible. However, this woman has no plans of giving up, and one bad** chick. Where will her endeavors to restore peace take her? Oh and watch out for that killer ending! Kingdom of the Damned is a prelude to the Kingdom Journals series. It can be read as a standalone. It took a couple of chapters for me to get into the writing style, but once I got into the flow it was great. I like the different perspective this story takes on. Usually when you look back in history, you think about witches being persecuted, but here it is the witches who are after the vampires. I also found the more unique way of looking at vampire culture interesting. Another aspect of the story Kingdom of the Damned is a prelude to the Kingdom Journals series. It can be read as a standalone. Another aspect of the story that I found intriguing is the nature versus nurture kind of thing. Anne is raised in hiding and with humans. She learns to adapt, but then as she learns more about her heritage as a vampire, she sees how her time among humans has altered her compared to the other vampire tribes. She is considered idealistic, even unrealistic to some degree, as she travels among her own people to try to form alliances. As you read, you wonder if something will push her over the edge and cause her to be more vampire and less human-like. Kingdom of the Damned is not the first novel I’ve read by Tricia Copeland but this is the first I’ve read of this particular series and her take on a paranormal genre. I really wasn’t disappointed,I enjoyed the story immensely. I think what impressed me most about this story was the description and attention to detail. The story was dark and well paced with action, emotion and depth. The character development throughout the storyline was just as strong and I found myself really enjoying Anne’s character. Can you imagine living a life spanning centuries and what you could see and endure? Love, loss, experience. 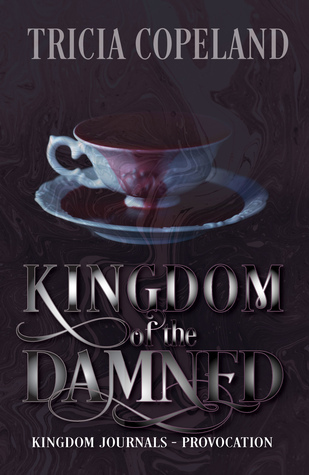 Kingdom of the Damned is a prelude to the rest of the series and read well as a stand alone. I am curious to see how this story ties in with the rest of the series and will be reading on to learn about the other characters more in depth. Tricia Copeland has definitely gained another reader here, if you like paranormal and come on, who doesn’t enjoy a good story with witches and vampires? I definitely recommend giving this a go! I have read a few books by this author now but I have to say I think is my favourite by far. From the very first page I was immersed into the story. The characters and the plot developed well the deeper I got into the story. It has definitely set me up for the rest of the series. I love the descriptions that the author uses; she is really good at world building. I really liked the time period that they story took place in too, I love historical romance stories but I haven’t read many historical paranormal stories so it was really nice to read something a little different. I really liked the characters and feel like I really got to know them well. I thought Anna was a great character, really strong and independent. I am really looking forward to reading the rest of the series – I have a feeling that it is going to be a good one! Kingdom of the Damned contained several areas where the book seemed to drag BUT it also included many moments that peaked my interest and had me curious to see where Anne’s journey would take her next. During her globetrotting adventure, a woman of ONE became a leader of many. She aspired to bring peace to all – vampires, witches and humans. During her ambitious endeavor, she fought many battles. She lost many dear friends and loves. Despite everything, her cause stayed true. Even though Kingdom of Kingdom of the Damned contained several areas where the book seemed to drag BUT it also included many moments that peaked my interest and had me curious to see where Anne’s journey would take her next. Even though Kingdom of the Damned began with the loss of Anne’s family, the ending passage gave Anne hope for a brighter future. This last chapter, the surprise ending, is what I’ll remember most about the book. It made me want to continue reading more about Anne and, like many of the characters, I wanted to join her on her journey --- wherever it takes her (us). Kingdom of the Damned: Provocation (Kingdom Journals) By Tricia Copeland. This book was great with a main character I feel readers can connect with and root for. I’m not always in the mood for a paranormal type story but this one immediately hooked my attention and kept it until the very end. The bond that the characters have is strong and inspiring. It’s a well written story and paced nicely never feeling rushed or dragging on. The author does a wonderful job of taking on the paranormal world a Kingdom of the Damned: Provocation (Kingdom Journals) By Tricia Copeland. This book was great with a main character I feel readers can connect with and root for. I’m not always in the mood for a paranormal type story but this one immediately hooked my attention and kept it until the very end. The bond that the characters have is strong and inspiring. It’s a well written story and paced nicely never feeling rushed or dragging on. The author does a wonderful job of taking on the paranormal world and keeping readers drawn in. Anna is one of the best written main characters I’ve seen in a while, I truly enjoyed reading about her. I’m excited to read more by this author. Giving this story a five star review and highly recommend it. I love reading Paranormal / Fantasy books. So, when the opportunity arose to read Kingdom of the Damned by Tricia Copeland, of course I jumped on it. It has all of the paranormal elements that I like to get lost with. I have to say that the author did impress me with her ability to weave this story and captivate my attention. I literally sat on the edge of my seat, wondering who I was going to be rooting for. This book and it’s storyline was defin I love reading Paranormal / Fantasy books. So, when the opportunity arose to read Kingdom of the Damned by Tricia Copeland, of course I jumped on it. It has all of the paranormal elements that I like to get lost with. This is not my first book by this author but it is my favorite so far. This book is a paranormal story that has witches, vampires and more in it. It pulled me in right from the beginning and I couldn't wait to see what would happen next. The characters are connectable and lovable. My favorite character is Anne, she is strong and independent. I enjoyed watching her grow throughout the story. I highly recommend this book. This paranormal tale hooked me immediately! I continue to appreciate the author’s writing style. She gives a unique voice to her characters and excels at character development and relatability. The plot is engaging and well-paced. The characters are well-developed and interesting. I loved this book and am looking forward to reading it again very soon! I have read every book in this series and I love that Tricia gave us a backstory!! It helps so much with all the other books. This book was amazing, Tricia has a way of writing that makes you feel like you are right there in all the action! If you haven't read this book you really need to. Also read the other books in this series! I love it when an author gives us the backstory!! It helps so much with all the other books. This book was awesome and you cant help but get pulled I to the story with all the details you are given.If you haven't read this book you really need to. Also read the other books in this series! Ann was an awesome character. She found love and lost loves. I can't believe how she made it through each one. I would enjoy reading more of Ann's story with her new love that is a secret in it's own. I won't give away any spoilers for the ending. If anyone is interested in what's happening they have to read the book. I had two problems with this book. 1. It dragged on a bit in the middle then sped up to the point where it was almost disorienting. And it was kind of repetitive in some of the scenes. You had romance, travel, romance, travel and it didn't really pick up until the last chunk. But other wise, I really enjoyed the complexity and rawness of the characters and the story. I've never seen vampires and witches being written like this, which was extremely enjoyable to read about. Tricia Copeland grew up in Georgia and now lives with her family Colorado. Her newest releases are the young adult epic/historical fantasy, Kingdom of the Damned, a prelude to her Kingdom Journals series, Deepest Scars, a new adult romance, and Lovelock Ones, a sci-fi novel. Her fantasy books include Kingdom of Embers, Kingdom of Darkness, and Kingdom of Honor. Her new adult romance Being Me serie Tricia Copeland grew up in Georgia and now lives with her family Colorado. Her newest releases are the young adult epic/historical fantasy, Kingdom of the Damned, a prelude to her Kingdom Journals series, Deepest Scars, a new adult romance, and Lovelock Ones, a sci-fi novel. Her fantasy books include Kingdom of Embers, Kingdom of Darkness, and Kingdom of Honor. Her new adult romance Being Me series includes Is This Me?, If I Could Fly, and Being Me. Her first YA paranormal work Drops of Sunshine first appeared in Spellbound. If not on a trail, you can find Tricia at http://www.triciacopeland.com/, on Facebook, Instagram, Google+, Pinterest, or Twitter.